Asset location can help you significantly increase your after-tax retirement income, without saving more, retiring later, or trying to “beat the market”. You may have heard the term asset allocation. This is simple the process of diversifying your portfolio across different types of investments or “asset classes” such as stocks, bonds and real estate. The goal with asset allocation is to match your portfolio to your goals and risk tolerance. 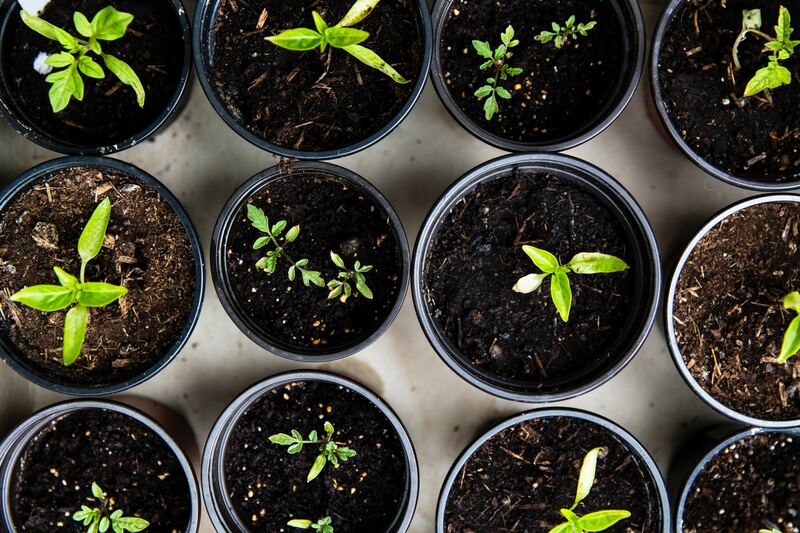 Asset allocation is about putting those assets in the right “buckets” in order to minimize taxes – the same way you would want to plant a seed in the right type of soil. In this case, the buckets I am referring to are account types with unique tax treatment – such as Roth IRA, 401k, etc. Since stocks, bonds and real estate are all subject to different tax rules, you can maximize your after-tax returns by putting the right investments in the right buckets. Done right, you can save yourself tens (or even hundreds) of thousands in taxes over your lifetime. In this example, the investor is starting with a $300,000 portfolio – $100,000 in a Roth IRA and $200,000 in a 401k. We assume that the target asset allocation is 60% stocks and 40% bonds. We also assume that stocks will return 8% per year, bonds will return 3% per year and a tax rate of 35%. In the base case, the investor does what most people do, he invests both accounts the same way, 60% stocks and 40% bonds. In the asset allocation scenario, he instead favors stocks in the Roth and bonds in the 401k. It is important to note that he still maintains a 60/40 mix across both accounts. Since both Roth IRA’s and 401ks grow tax-deferred, the total values of both portfolios grow perfectly in tandem. However, the power of this strategy is seen at the very end – after accounting for taxes on the withdrawals. Because the second scenario favored putting the higher-return stocks in the Roth account and the lower-return bonds in the 401k account, the second portfolio ends up having a relatively larger Roth and smaller 401k. Since the Roth withdrawals are tax-free, the after-tax value of the portfolio is $151,171 higher than the standard approach. This represents about 10% more in after-tax retirement income! As this simple scenario demonstrates, asset allocation is not something to be ignored. In order to perform asset allocation well, you must first understand the tax treatment of different types of investments. Stocks – Owning stocks can generate taxes in two ways – dividends and capital gains. Dividends are distributions companies pay out of their income to their shareholders. If you own a stock that pays a dividend, you must pay taxes on the proceeds. Capital gains result when you sell a stock that has increased in value. You only have to pay this tax when you realize the gain by selling the stock. You can defer paying capital gains taxes as long as you hold the stock. Both dividends and capital gains are usually taxed at preferential rates between 0 and 20% (15% for most tax-payers). Taxable bonds – Taxable bonds include corporate bonds and treasury bonds. These investments pay interest or coupon payments, which are taxable at ordinary income rates. You can also incur capital gains or losses, but these are usually minimal for bonds. Municipal Bonds – These bonds are issued by state and local governments. They are similar in many ways to other types of bonds, except that the interest they pay is exempt from federal taxes. Real estate – real estate has some unique tax treatments. Real estate income is taxable at ordinary income rates. However, the IRS allows owners of real estate to depreciate the value of the asset over time. This creates a tax deduction that can help offset the income the property generates. In addition, while real estate can produce capital gains, there are a few options for real estate owners that allow them to continue to defer those gains, even if they sell a property (ex. 1031 exchange and exemptions for primary residence). 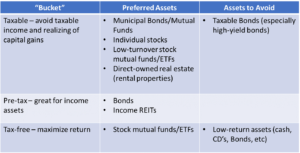 Now that we understand how different investments are taxed, let’s look at different account types and how we can utilize each one to get the most out of each type of investment. Taxable – these are accounts that are owned by you individually, jointly with a spouse, and trust accounts. They are taxable on an annual basis. This means that every year any interest you receive is taxable at ordinary income rates and capital gains are taxable at lower capital gains rates. If you are in a high tax bracket, you will generally want to avoid investments that generate ordinary income, like taxable bonds. You will want to favor tax-free investments like municipal bonds and investments that allow you to pay lower dividend and capital gains rates like stocks. Pre-tax – these are retirement accounts such as a 401(k), 403(b), or Traditional IRA. Money that you contribute to these accounts is consider “pre-tax” meaning you didn’t have to pay tax on income you contributed to these accounts. In addition, unlike a taxable account, you don’t pay taxes on these accounts for the interest earned or capital gains incurred each year. Instead, taxes are “deferred”, and you will pay taxes when you make withdrawals in retirement. At that point, the withdrawals will count as ordinary income. This combination makes these accounts ideal for taxable bonds and other investments that would normally generate high taxable income. Tax-free – these are accounts that won’t ever be taxed, such as Roth IRA’s and Health Savings Accounts (assuming withdrawals are used for medical purposes). Roth IRA’s are basically the opposite of traditional IRA’s – you don’t get a tax break when you contribute, but you get to withdraw the money tax-free in retirement. Since you won’t have to pay taxes on withdrawals, you want to maximize the growth potential of these accounts. Typically, your highest growth assets should go here. Of course, these are ideals. Some of you may have your entire nest egg in pre-tax 401k accounts. In this case, asset location does not mean you should only invest in bonds. Asset allocation trumps asset location. Your first decision is how much of your portfolio should be invested in each asset class. Only then should you try to locate each asset class to its most ideal bucket. Let’s look at a few examples to see how this might work. 40-year-old couple with $300,000 in a 401k, $100,000 in Roth IRAs and $100,000 in a taxable account. They are in the top marginal tax bracket and have a target asset allocation of 80% stocks and 20% bonds. In this example, we put all the taxable bonds in the pre-tax 401k and invest the tax-free Roth as aggressively as possible. This will hopefully allow the Roth to grow at a faster rate than the 401k and provide more tax-free income in retirement. In the taxable account we use mostly stocks and a small amount of municipal bonds (perhaps it’s their emergency fund). Most of the growth in this account will come in the form of capital gains, which can be deferred as long as they hold the stocks. The little income the account will generate on an annual basis will be either tax-free (from the municipal bonds) or taxed at lower dividend rates. 65-year-old retired couple with $1,000,000 in a pre-tax IRA and $1,000,000 in a taxable account. They are in a 22% marginal tax bracket and have a target asset allocation of 40% stocks, 40% bonds and 20% real estate (represented by 2 rental properties at $200,000 each). In this example, they hold the real estate directly, which makes sense to do outside of the IRAs. We fill the rest of the taxable account with stocks and municipal bonds. We could put all the bonds in the IRA, and just hold stocks in the taxable account. After all, we prefer to have most of the growth in the taxable account where we’d pay lower capital gains rates, than in the IRA, where withdrawals will be at ordinary income rates. But in this case, I’ll assume they want some safer investments in the taxable account to fund withdrawals in early retirement. As you can see, there’s not a single right answer. A lot depends on your specific needs and circumstances. However, by applying these principles, you can significantly reduce your tax burden and enjoy higher after-tax returns and more retirement income. If you’d like help with a customized asset location strategy to help you minimize taxes and maximize your after-tax retirement income, you can schedule a complimentary, no-obligation introduction. Just click here.